As well as perhaps the world's best coastal paths, Cornwall is also blessed with several interlinked inland mining heritage trails, the most well-known being the 12 mile long Coast to Coast (CC) trail (known locally as the Bissoe trail), linking what were, in the 19th century, two of the county's most important ports, Portreath on the north coast and Devoran on the south. The Mineral Tramway Network of trails follows many of the old mining railways that connected copper and tin mines with these two busy ports, which handled imports of coal for the steam engines and the export of ore. 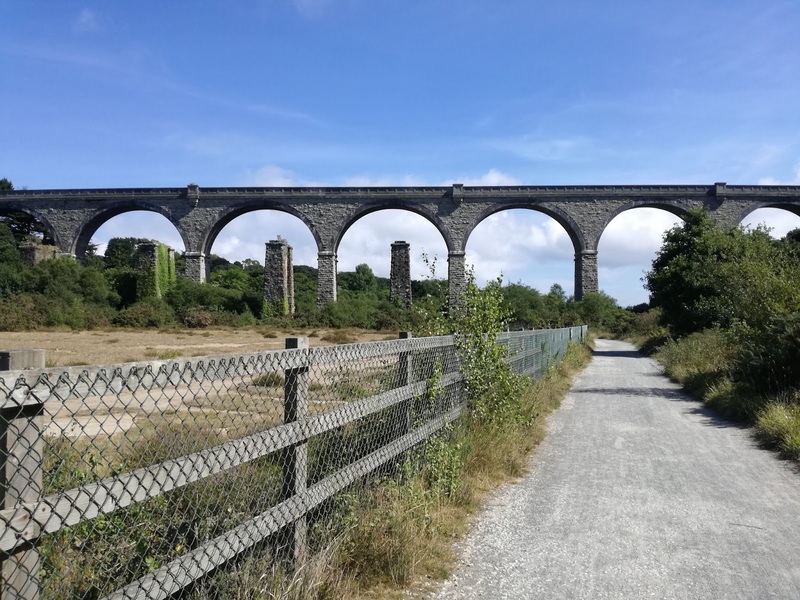 The CC trail closely follows the horse-drawn Portreath tramroad which was opened in 1812, to service the mines in the Gwennap Parish, which were then the most important copper mines in the world. The Redruth and Chacewater Railway was built in 1825 and linked the mines around Gwennap, and those around Redruth, to the port of Devoran. For those of you spending a few days in Falmouth, before or after an MEI Conference, I have previously posted recommendations for what to do should you not have a car (posting of 11th March 2015), but if you do have a car, then there is a wealth of options in Cornwall, and if you have an interest in mining history, then exploring the CC trail either on foot or by bicycle, is a fabulous day out. You can park your car, have coffee or lunch, and rent a mountain bike and helmet at Elm Farm in the village of Cambrose, a couple of miles from Portreath, and from here you can either head back to the beginning of the trail at Portreath, or join the trail at Cambrose. A mountain bike, or hybrid, is advised, as the gravel and compacted earth surfaces are not really suited to road bikes, and around the intensively mined Poldice Valley the surface is hard and rocky. 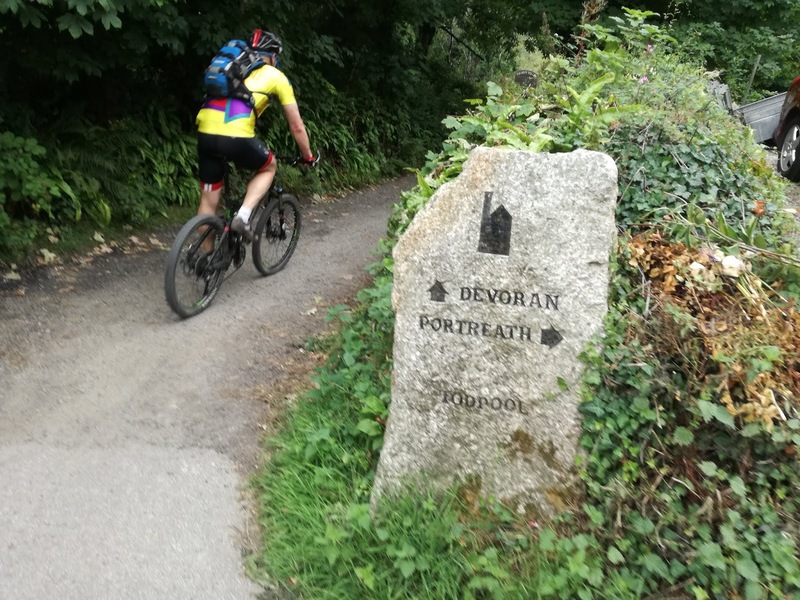 You will also need to keep your eyes open for the large granite route-markers, as in places the trail diverts briefly onto quiet country lanes, as well as a couple of major roads. If in doubt, wait a few minutes and you will see other cyclists who will point you in the right direction! The trail begins by the Portreath Arms pub, directly opposite the Portreath Bakery, where you might wish to sample one of their excellent pasties. The countryside trail to Elm Farm is a pleasant two and a half miles, running parallel with the main road to Redruth. 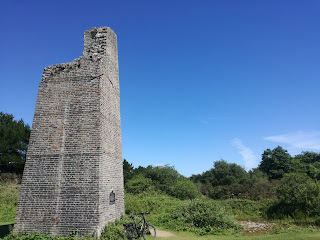 There are a couple of other trails linking to the coast to coast, but I would certainly recommend that you take the three quarter mile short detour to Wheal Peevor (posting of 1st July 2018). 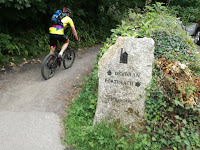 You will see the waymarker after about 4 miles and the route, mainly on country lanes, takes you to three of the finest preserved engine houses in Cornwall. Unfortunately direction signs disappear as soon as you take the path from the coast to coast trail, but luckily the area is favoured with dog walkers, so there are many people to aid you on your way, of if you have GoogleMaps, then just enter Wheal Peevor. Back on the CC trail I would recommend that you avoid the Wheal Busy loop at Wheal Rose Farm, which is an unpleasant diversion with little of value to justify the effort. There is little to see at Wheal Busy, a notable copper producer from the early 1720's, apart from the rather sad ruined pumping engine house. After 5 miles, we reach the best place for getting lost! Look carefully for the waymarkers after crossing the bridge over the busy A30. 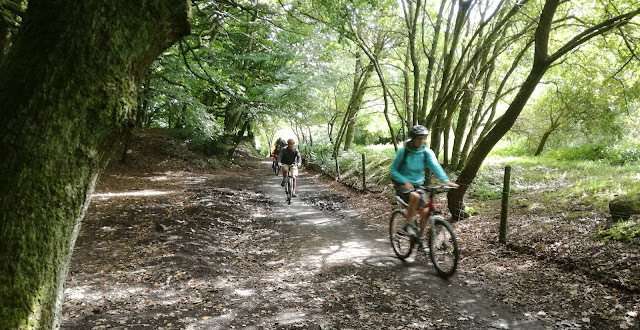 The route takes you by the Crossroads House Care Home, after which you turn right through the Fox and Hounds car-park, and then cross the road to pick up the trail again for some pleasant cycling on the tramroad through Scorrier Woods and the outskirts of Unity Woods. At 6 miles the Wheal Busy loop joins the trail again and it is worth taking the track through the deep and dark Unity Woods to Killifreth Mine's Hawke's Shaft pumping engine house. 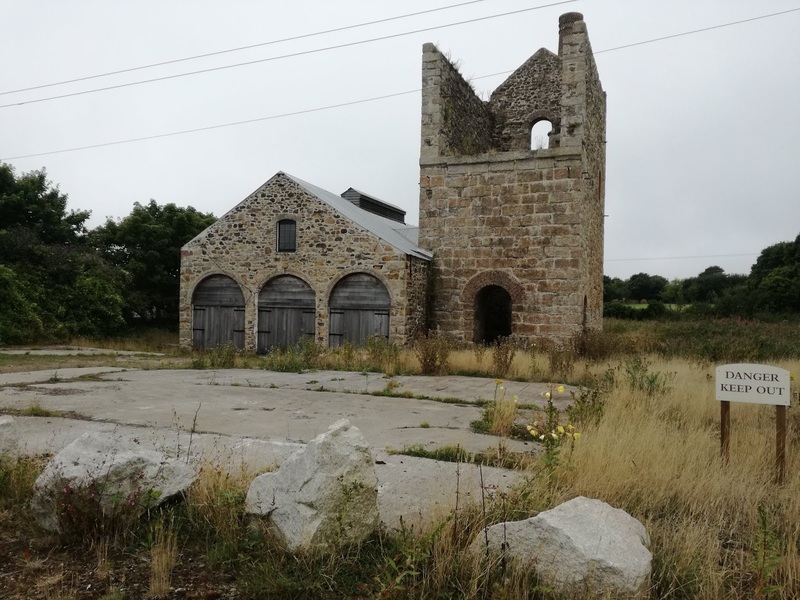 Killifreth was a small copper mine, and the engine house at Hawke's Shaft operated between 1893-97, and then when the mine converted to arsenic processing a bigger engine was used from 1912-21, which necessitated raising the stack to its present level, the tallest chimney in Cornwall. Be advised though that, although it is only half a mile to the engine house, the trail through the woods is definitely suited only for mountain bikes, being steep, narrow and rocky. 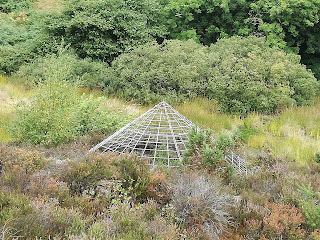 I suggest that you avoid the Little Beeside loop a little further on and carry on to the Poldice Valley, once the most important copper mining area in the world. 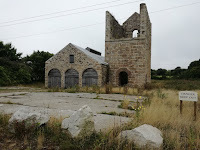 Over 3,000 shafts are known to have existed in the old Gwennap parish and although today most have been capped there may still be shafts which lie in wait for the unwary amongst the gorse and bracken of the old mining district, described in the early 19th century as the richest square mile on earth. 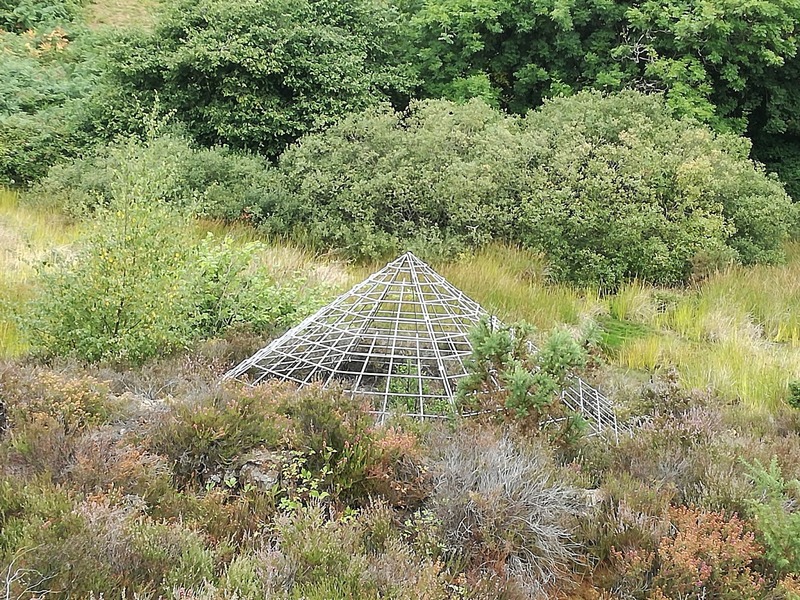 Now is the place to travel the short distance on the Little Beeside loop to the ruins of the Poldice Mine, which was originally a tin and copper mine, and by 1685 was employing between 800 to 1000 men and boys. By 1702 it was the deepest mine in Cornwall, having reached a depth of 106 fathoms (636 feet) and by 1788 the output of copper exceeded that of tin. Water was always a problem, and in the early 1740s five Newcomen steam engines were employed for pumping water from the mine. The mine manager John Williams planned the construction of the Poldice Deep Adit to help drain the mine, work commencing in 1748. This eventually linked up with adits from over 60 mines in the Gwennap area, to become the Great County Adit (posting of 8th August). The Gwennap mines were a fair distance from both the north and south coasts, and as a result incurred high costs to transport timber, coal and ore. In 1812 it was John Williams who constructed the horse-drawn plateway from his mines at Poldice through Scorrier to the newly-constructed harbour at Portreath. 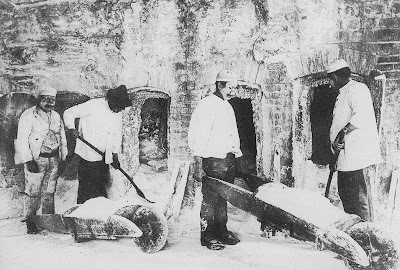 In 1867 the mine closed for the first time in its history, but resumed work again in 1870 producing arsenic, in great demand especially for the expanding Lancashire cotton industry, which used it in pigments and dyes, but by the 1910s most of the activity was over and although small-scale mining continued into the 1920s, it closed in 1930, the ruins seen now being the relics from the first arsenic works. In the foreground below are two buddles, a convex buddle in the centre and a concave buddle to the left. These were crude, but very widely used, devices to concentrate heavy minerals such as arsenopyrite. In the background are the remains of the calciners, which were used to roast and oxidise the arsenopyrite at high temperature. The highly poisonous arsenic trioxide was condensed as a 'white soot' in long labyrinths, which were periodically cooled and dug out by hand to recover the oxide, surely one of the worst ever jobs in mining, although they did have safety equipment including cotton wool nose plugs, handkerchiefs for breathing through and arms smeared with clay! Back on the trail we are now very obviously in mining country, with the waste from centuries of mining for copper, tin, tungsten, and arsenic on both sides of our route. 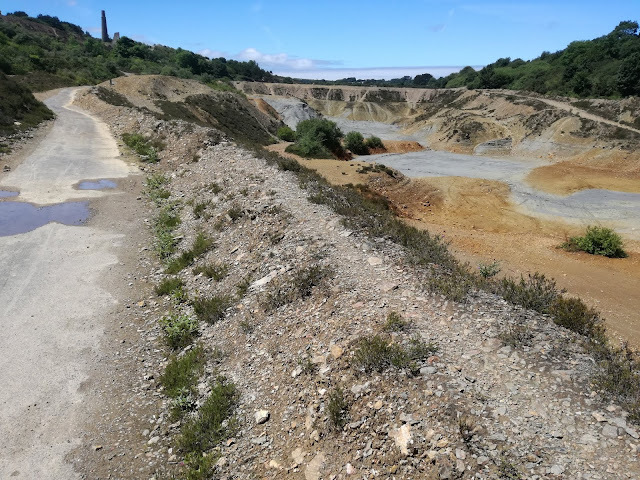 There are many 'off-piste' mountain bike trails meandering through the old tailings dumps, many of which have been reworked for tin and arsenic in more recent times, and the trail is now much more rugged and rocky than encountered previously. But after about a mile green vegetation returns, the only obvious evidence of mining activity being a few capped mine shafts and isolated tailings dumps as we approach the hamlet of Twelveheads and the Bon Appetit cafe, a great place to stop for light refreshments. From here, follow the country road and then left onto the trail a couple of hundred yards on, opposite the Wheal Andrew Counthouse. Immediately to the right on the trail is a very narrow overgrown path leading down to the Carnon River and the portal to the Great County Adit, but there is little to be gained by walking down the track, as access to the portal is now securely blocked and hidden. A little further on look back, and above the valley are the buildings for the concentrator of the Mount Wellington tin mine, which operated between 1976 and 1991. Nine miles from Portreath we reach the Bike Chain Bissoe Bike Hire. Another great place to stop for light refreshments, bikes can also be rented here should you be planning a trip starting at this end of the trail. Shortly after crossing the road and rejoining the trail the last evidence of mining activity is the ruin of the Point Mills arsenic refinery, which was operated for a century, ending with the outbreak of World War 2. The last 3 miles to Devoran Quay is an easy ride through the Bissoe and Carnon Valleys, once one of the most intensively mined regions on earth, although little evidence now remains. The highlight of this last few miles is passing under the impressive Carnon Viaduct, part of the Truro to Falmouth branch line. The nine-arch masonry viaduct replaces an earlier structure designed by Isambard Kingdom Brunel for the Cornwall Railway and opened in 1863. The present viaduct opened in June 1933, the timberwork of the original structure being dismantled and removed, but its masonry piers still stand beside the replacement viaduct. The final mile of the journey is through the pretty village of Devoran, to the end of the trail at Devoran Quay on the River Fal's Restronguet Quay. 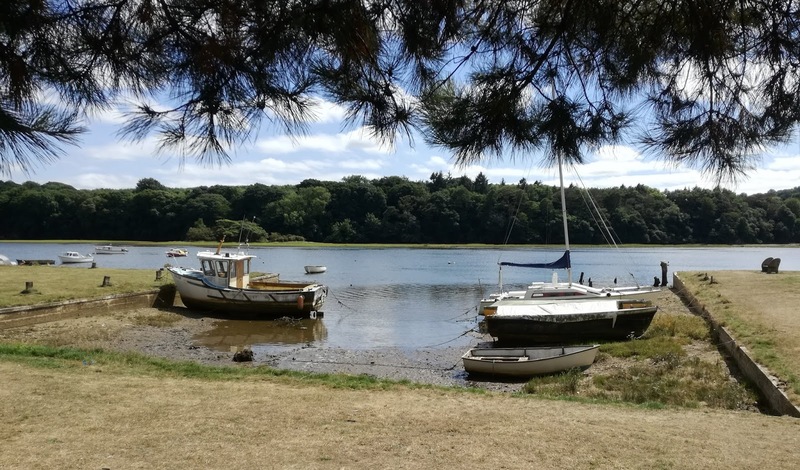 The demise of Devoran as a port occurred in 1876 when disastrous floods caused the neglected County Adit to release thousands of tons of water, carrying rubbish and silt down-river to Restronguet, blocking navigation to all but the lower quays. Wonderful blog post. I have cycled the Bissoe trail many times and never knew that the Bissoe Valley was once 'one of the most intensively mined regions on earth'. And never stopped to look at the ruins of the Poldice Mine etc. Next time I will cycle this amazing trail with my eyes wide open. Many thanks again- this must be the definitive guide to the Coast to Coast trail.